One of the standout trailers that was shown over the weekend at San Diego Comic-Con was Godzilla: King of Monsters. Legendary did an awesome job with their promotional campaign, teasing footage and setting up a Monarch Sciences website as well as social media accounts. While the teasing was fun, it was nothing compared to the epic trailer for the monster movie. Godzilla is shown with Rodan and Mothra, but we only got a brief glimpse of King Ghidorah, and even then, the monster was frozen in ice underneath Antarctica. However, the new Comic-Con poster for Godzilla: King of the Monsters puts the King front and center. Following the awesome Godzilla 2 Comic-Con trailer, the new Godzilla: King of the Monsters Comic-Con poster looks like it should be the cover art for an epic heavy metal album by Dio. Godzilla is here too, but he doesn't seem to be doing so hot as he's wrapped up by the three-headed King Ghidorah, who is getting ready to strike. For fans who were disappointed that Ghidorah wasn't fully represented in the trailer, this poster is for you. "Long Live The King," is printed on the poster which is a line that was said by Charles Dance's character at the end of the trailer. The first trailer for Godzilla: King of the Monsters gave fans far more than they were expecting to see, especially since the movie doesn't come out until May of next year. While Godzilla, Rodan, and Mothra are given adequate screen time, King Ghidorah is being hidden, which is because Legendary didn't want to give everything away in the first trailer. The wait for the true unveiling of the monster will surely be a major part of the next wave of the promotional campaign, which was followed up over the weekend with a Godzilla size evolution video, and there's already anticipation brewing for that next unveiling. Godzilla: King of the Monsters is the sequel to 2014's Godzilla and sees a very paranoid human race coming to terms with the fact that they live alongside radioactive monsters that are bigger than most buildings. The destruction caused by these radioactive beasts it apocalyptic and the trailer for the movie makes the death and destruction look epic as well as something to look forward to. We've seen the damage that Rodan and Mothra can create, but that might be nothing compared to the powers of King Ghidorah. Godzilla: King of the Monsters opens in theaters on May 31st, 2019. From a script by Michael Dougherty, Max Borenstein, and Zach Shields, the film stars Vera Farmiga, Charles Dance, Millie Bobby Brown, Ken Watanabe, O'Shea Jackson Jr., Bradley Whitford, and Thomas Middleditch. Godzilla: King of the Monsters still won't be out for nearly a year, so expect the Monarch Sciences website and social media accounts to drop some more clues over the coming months. 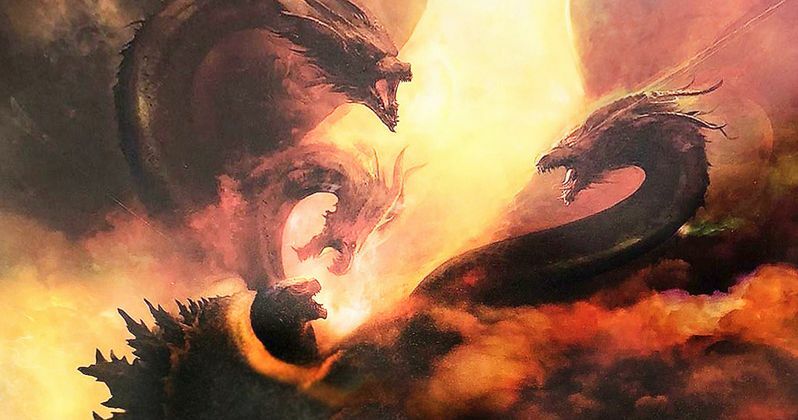 While we wait for more footage to drop, you can check out the epic King Ghidorah Comic-Con poster below.